Thank you for taking action! In the last 48 hours thousands of people across Toronto have emailed the Mayor directly — asking him to stand up for our city and vote in favour of a legal challenge to Ford's undemocratic Bill 5. This is how we will win tomorrow's vote at City Council. Will you help us get even more people to contact Mayor Tory and City Council? 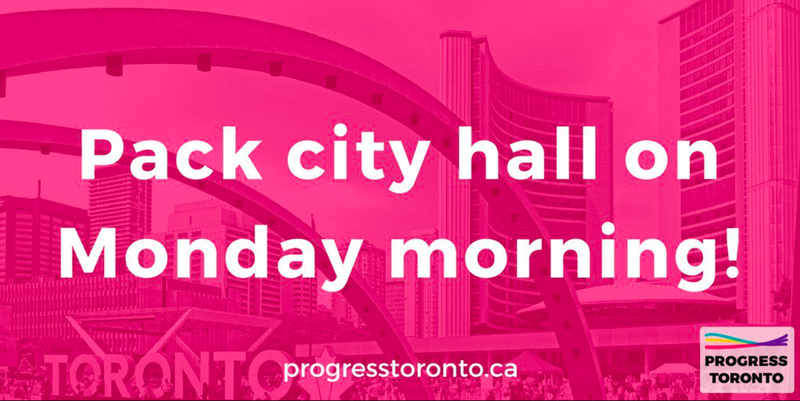 Tomorrow morning we are filling the Toronto City Council Chambers to show our support for a legal challenge to Bill 5 and to demand Mayor Tory and City Council stand up to Ford. Join us! Our best chance of winning the legal case against Ford's undemocratic Bill 5 is if the Mayor and Councillors throw the full weight of the City of Toronto into this legal challenge. That's why we need to win the vote. If we can get thousands of people tonight to take action we will win tomorrow.